A new blockchain initiative is bringing cryptocurrencies to the commodity financing space, providing US$10mn-worth of loans to 50,000 smallholder farmers in Africa. 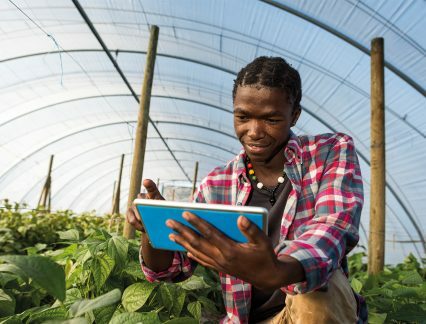 The project is run collaboratively between Block Commodities, a blockchain-focused commodities trader operating across Africa; Wala, a blockchain-powered financial services platform; Dala, a provider of a crypto-token designed to enable instant, zero-fee and borderless micropayments; and FinComEco, a firm that helps farmers get access to a wider market for their crops. In what they call a “first-of-its-kind partnership”, the parties will develop and operate a range of platforms, projects and initiatives in the agricultural commodity markets sector in Sub-Saharan Africa. The goal is to help farmers maximise the value of their agricultural output by providing access to financing and the ability to track their commodities through blockchain technology platforms. It is, according to Chris Cleverly, CEO of Block Commodities, “a huge opportunity and potential reset for finance in Africa”. The first project will kick off in Uganda, where Block Commodities and FinComEco will lend 100 million Dala tokens – equivalent to US$10mn – to smallholder farmers in order for them to purchase fertiliser. In time, the same will be provided to local farmers in South Africa, Congo, Malawi, Zambia and Zimbabwe. Speaking to GTR, Stefania Barbaglio, who is in charge of Block Commodities’ public relations, says the project is the first to use tokens for commodities lending. Utilising cryptocurrency and blockchain technology, the firms are able to streamline payments and loans, and thereby provide farmers with access to financing at more affordable interest rates. The token will work as a bridge currency between fiat currencies, making cross-border transactions “more smooth”, she says. “There are all these different stages with different currencies: if farmers are based in Uganda and the fertiliser company wants to be paid in US dollars, they may find it hard to convert their local currency to US dollar,” she adds. The farmers will be able to transact and cash in and out with Dala at over 100,000 merchants throughout Africa, facilitated through partnerships that Dala and Wala have with Mvendr, a mobile point-of-sale service for small merchants, and Spazapp, an e-commerce management platform. The loans will be paid out to the smallholder farmers targeted by the project in October this year. For Block Commodities, the fertiliser project in Uganda is “just the beginning”, and it will be looking to expand to other projects – including other commodities and countries – later this year. This, Barbaglio says, could involve partnering with other firms and using other tokens.